I am now nearly two months out from my surgery, and learning new things daily about my sleeve and its capacity as a powerful tool for weight loss. As each day passes, I’m finding there is still so much that I wish I’d been prepared for. Again, this is not to fault my doctor–he is still fabulous! There really is no possible way he could have prepared me for everything I have encountered since I’ve been home and out of his care. But there are still some things I wish I’d been better prepared for. Because I have enlisted an entire team of healthcare professionals working with me, I really should title this post “Things I Wish My Healthcare Team Had Prepared Me For” instead. So that’s really what this second installation is all about. Fighting the Fat Girl/Boy in your head is not easy. It is messy. It requires that you get real and brutally honest with yourself. It is raw, and it hurts like a mofo. This is why employing a mental health professional to help you along this path is critically important to your success. In my case, I’ve hired two. I discuss different issues with each one, and both have been instrumental in helping me deal with the head game that I now manage on a daily basis. Your surgeon only operated on your stomach, not your brain. Find a good therapist (or two) and let them help you manage your head. The head baggage is what needs the most work. The eating and drinking is easy; the sweeping out of old behaviors and thought patterns and their subsequent replacement with new improved behaviors and thought patterns is not. That pressure in your chest when you’ve eaten more than you should? It’s real. FEEL IT and STOP EATING. NO, REALLY. STOP EATING IMMEDIATELY. Unless you want to see your meal again. Or want to feel absolutely miserable for a good little bit, anyway. I’ve been lucky in that I haven’t puked, but I have come awfully close. The soreness in your abdomen will finally subside by the end of the second week enough for you to sleep on your side comfortably. This will also depend on where your incisions are. My largest one was on my left side so I couldn’t sleep on that side for nearly 3 weeks. When I did, I splinted my belly with a pillow and that helped. 2 ounces of protein does not look like you think it looks. It’s actually larger. Use a food scale–this will be one of the best tools you can use to manage portions, along with measuring spoons, cups and tiny plates to eat off of. 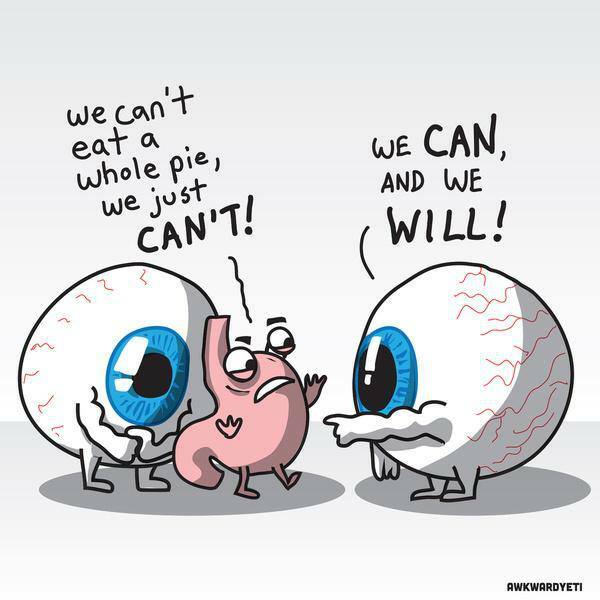 Your eyes really are bigger than your stomach. See? And because your eyes are a direct extension of your brain (bet you didn’t know that, did ya? ), you will have to fight them with every meal. Remember, your surgeon operated on your stomach, not your brain. Eating and drinking become a chore, something you have to do, not necessarily something you want to do. This is now your second job (if you work), and your only job (if you don’t). And because it is a job, it is not as enjoyable as it once was. Your energy levels will increase slowly post-op, but you will not feel quite like yourself for a little while. Not just yet. I am just NOW starting to feel back to normal, and I am 8 weeks out. The aches and pains you will feel in places you’d long forgotten about–they will come back to haunt you. With a vengeance. This is the one thing I wish I’d known about prior to surgery because there are days when I get out of bed and the pains in my back and hips are ridiculous. I roll out of bed most mornings and I feel like I am really 80 instead of 40 because I am so stiff and sore. And the pain is in odd places. I have a feeling that it is from the weight being redistributed more than anything else. I am hopeful that as it continues to come off, and things continue to shift that the pain won’t be nearly as intense. When your doctor’s plan tells you at the six week mark that “eat a regular diet,” they don’t tell you that raw nuts and veggies might not sit well in your new little sleeve for a long while. After my recent failed foray into trying walnuts this week, I’m sticking to nut butters and cooked veggies until I am another month or so out when I might be brave enough to try eating them again. Not everyone you meet will understand your new life and what it is like to live in your body with the modifications you have paid someone to make to it. You will field questions ranging from, “Is that all you get to eat?” to “You only eat how many calories?” to “Is that like eating low-carb?” They will not understand that yes, you can be a functional human being that can subsist on fewer than 1,000 calories each day–you’ve got plenty of fat stores to live off of! They will also not understand that the weight will come off quickly and that because your health is being monitored and managed by a doctor (or two, in my case) that it is okay for it to be flying off as fast as it is. You may hear criticism aimed at you for “taking the easy way out.” You may hear some folks say things that they don’t realize might bother you like, “Ohmigod, I am sooooooooo fat” when they are far thinner than you and do not need to lose weight. I don’t make these lists to discourage folks from pursuing surgery as an option for weight loss. That’s not it at all. I make these lists because I want you, the reader, to understand what living the life of a post-op is like. If you’re someone considering surgery, I think it’s important to understand what sorts of things you might encounter in your daily life after surgery so that there are no surprises. I can’t prepare you for everything, but I can try to soften whatever blows life will strike you with by arming you with information. And if you’re not a bariatric patient, but supporting one, or just curious about what it’s like for us, then let this post (and others like it) serve as a porthole into what life is like for those of us who have chosen a difficult path to better health. This entry was posted in challenges, la guerra, vsg, weight loss surgery, what's up doc? and tagged bariatric surgery, health, pain, post-op eating, post-op life, VSG, vsg realness, what's up doc?, WLS, work that head game. Bookmark the permalink. I have been reading through your blog the last couple of days and really appreciate posts like these! I’m looking to have RNY next year. Even though it’s not the same, I would imagine a lot of these things you wish you had known will be similar for me. 🙂 So, thank you!! !